As customers or trade allies fill out an incentive application, they often get stuck on one common question: “What is the primary heating system?” This seemingly easy question may be more complex than expected, and the answer will determine customer eligibility for certain incentives. The Home Retrofit Specifications Manual defines primary heating system as “the main heating equipment that is permanently installed and designed to provide the majority of heat inside a home, regardless of use or condition”. This definition can help you decide if the customer may be eligible for incentives. 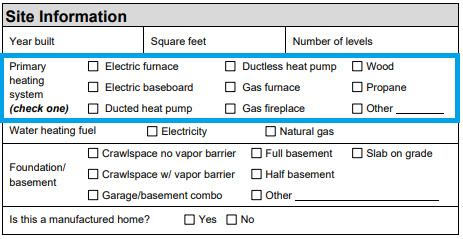 Home Retrofit incentives are only available for homes with an electric or natural gas primary heating system with fuel provided by Portland General Electric, Pacific Power, NW Natural, Cascade Natural Gas, or Avista. By answering the primary heating system question early in the process, you’ll avoid confusion and possible customer complaints about available incentives. If you have any questions on how to identify the primary heating system, or how to fill out applications, please reach out to the Residential trade ally team at 1.866.365.3526.